Yeats’ words seem eerily true as the horrific news keeps coming in. Just out of Pride season, the world seems full not of promise or love but of hate. As I write, protesters, from the left and right — some carrying guns — are arriving in Cleveland on the first day of the Republican National Convention. On July 17, Gavin Long, a black veteran, killed three police officers and wounded three others in Baton Rouge, La. Days earlier, Micah Johnson, another African-American veteran, fatally shot five police officers and wounded nine others. Montrell Jackson, one of the police officers killed in the Baton Rouge shooting, was African American. Gay Latino police officer Jesus Retana was among those injured in the Dallas shooting. The shootings appear to have been a (deranged) response to the recent brutal police shootings of black men Philando Castile in Minnesota and Alton Sterling in Baton Rouge. To add to the toxic mix, there is conflict between some in the queer community and Black Lives Matter. Like everyone, white, black, brown, queer or hetero, I’m angry, sad and struggling to process this horror. How do we move forward with any hope in this despairing moment? Recently, in Union Station in D.C., a police officer noticed that I couldn’t find where to board the train to Baltimore. (I’m legally blind.) The officer not only gave me directions, but bought me a cup of coffee. I was thankful for his kindness. But I couldn’t help but wonder how he would have treated me if I’d been black, trans or homeless. The queer community historically has been harassed by police. The Stonewall riots, considered the start of the modern queer rights movement, were a response to a police raid on the bar. In the 1950s, gay men were arrested for looking too feminine and queer women were stopped by police for looking too masculine. Today, queer people, especially, of color and trans, continue to be unfairly treated by (some) police. “Discrimination and harassment by law enforcement based on sexual orientation and gender identity is an ongoing and pervasive problem in LGBT communities,” according to a 2015 Williams Institute report. Given the unjust way that police have often treated LGBT people, it’s hard to understand why some in our community don’t support Black Lives Matter. I wouldn’t presume to speak for people of color or to say I know what it’s like to be black and racially profiled by a police officer. I don’t have kids, but if I did I wouldn’t have to have “the talk” that African-American parents have to have with their kids about interacting with law enforcement. Talking honestly about racism and police shootings is incredibly difficult. I have no ready words to offer. Yet, having endured raids, abuse and mistreatment by the police throughout our history, I can’t help but wonder: how can anyone who’s queer not try to be an ally with people of color, hetero and LGBT, who encounter racial disparities from law enforcement? Meanwhile, the shootings of police officers in Dallas and Baton Rouge are beyond contempt. Many good people, gay and hetero, are cops. Especially after Orlando, I’m grateful for the police who work hard to protect our community. I can’t imagine how hard it is to be a police officer, doing his or her job, when so many distrust, or even hate, the police. “In uniform I get nasty hateful looks and out of uniform some consider me a threat,” Jackson wrote on Facebook shortly before his death. To move beyond despair, we must work to stop the violence and the hate. KATHI is the clarion voice of our time. WHY do we have to have a mortgage ad audio pop up to distract us? ‘ROSEDALE FEDERAL BANK” is not what I want to hear when I read KATHI’s article. Kathi who is a Great Mind over The Material And if we want to reread we have to hear the ad again. Oh how this demonstrates the difficulty for the wise to be heard over the crass. LGBTQ people demonizing and stereotyping an entire profession of over three quarters of a million sworn officers (many of whom are LGBTQ themselves)– for the despicable actions of a few– is hypocritical and bigoted on its face. Moreover, any organization that tacitly encourages the demonization and cold-blooded murder of law enforcement officers does not deserve the support of anyone, LGBTQ or straight. One can easily be a stronger ally of people of color and other minorities encountering biased law enforcement without aiding bigoted, discriminatory, fraudulent and $elf-$erving organizations that encourage reactive hate and violence. *ALL* people ought to reason and research the truth for themselves. Half-truths or less can be misleading lies designed to fatten some activists’ pockets. Obvious profit motives aside, in the wake of Orlando, LGBTQ people, in particular, should not be contributing to the demonization and incitement to violence against police first responders. And what group is that who does? What makes you think it applies to a single *organization* — or any *organization*, Cub? And “tacitly encourages” are operative words in that simple statement. Obviously, readers can and should make their own decisions based upon the words and actions, of record, of any advocacy organization in question. 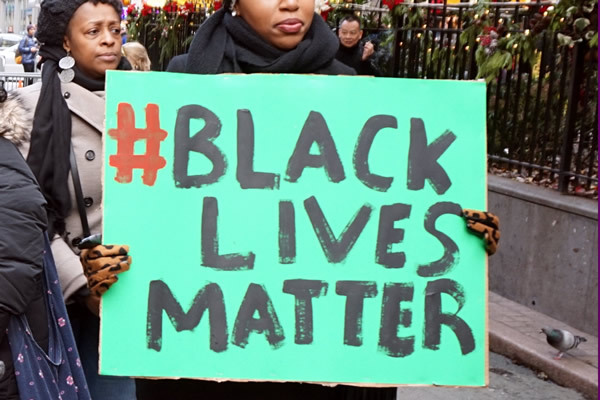 Why don’t more of us support Black Lives Matter? We didn’t build a movement around Jeffrey Dahmer. He’s not insane and violent, he’s just a gay man with alternative dietary needs. Well noted. Nothing in this life is entirely equal. Levels of history and hurt also matter. It follows that the defense mechanisms and organizing strategies used to overcome one group of peoples’ oppression is substantially different from that of other groups. An important consideration is the awareness and perception of the differences in the depth and breadth of damages done, over vastly different spans of time, that influence the level of prevailing empathy felt by any given group of oppressed peoples for other groups of oppressed peoples. We are all human animals constantly subject to millions of years of instinctive prejudice and fear. That’s, in part, a survival/self-preservation mechanism. However, we measure our civilized conduct, indeed, our civilizations by our (seeming) ability to recognize and overcome those animal instincts– cooperating, using our common attributes to improve our lives, families, communities, cities and nations. We all recognize at some level that personal and institutional discrimination against our fellow human beings (even biased policing)– which results as a response to our own ignorance and fear of the unknown– is a softer, less threatening prejudice than that driven by hatred/ animus and intentional distribution of misinformation against. That’s one reason this conversation about race and other related differences among groups must be ongoing, persistent and deep– especially in this country. ‘gay’ or ‘queer’ etc. does NOT automatically equate to being politically conscious or, for that matter, anti-oppression. As the late brother Malcolm X (el-Hajj Malik el-Shabazz) correctly said, “Keep your religion between you and your God.” So I say to those of you who identify as being LGBTQ, Keep Your Sexual Identity Between You And Your Own Consciences — and DO NOT TRY TO MANIPULATE THE ONGOING CENTURIES-LONG LIBERATION STRUGGLES of Black, White, Brown, Red, and Yellow people. Enough is enough! LGBTQ those identifying usage rather seek help. Externally other groups then, revert Black front actually protagonist assist destroy LGBTQ society. Ask Jay Z,LL.Cool J and Magic Johnson whom loving son EJ jr is example for whom? I say Magic wealth could make difference since owns, REITS ask gentrification effecting the community. Problem Black society condoning LGBTQ where is equality of diversity enough Alice Walker and Da Brat assist LGBTQ agenda! Black face hostilities from gender and “close men it’s sin to defend equality bigotry “no such thing as Black LGBTQ” as Eddie Murphy the Cover man!